New Delhi: Over the past few decades, Road accidents had evolved from being a mere buzz in people’s life. Every day, Millions of Indians drive on Roads and around 400 from them never come back home. Road Deaths are biggest cause of Unnatural Deaths in our Country. At the same time bad road behaviour, rampant road rule negligence causing Accident, Stress & Loss of productivity to all Road Users, hurting daily commuters & impacting every Indian Citizen. 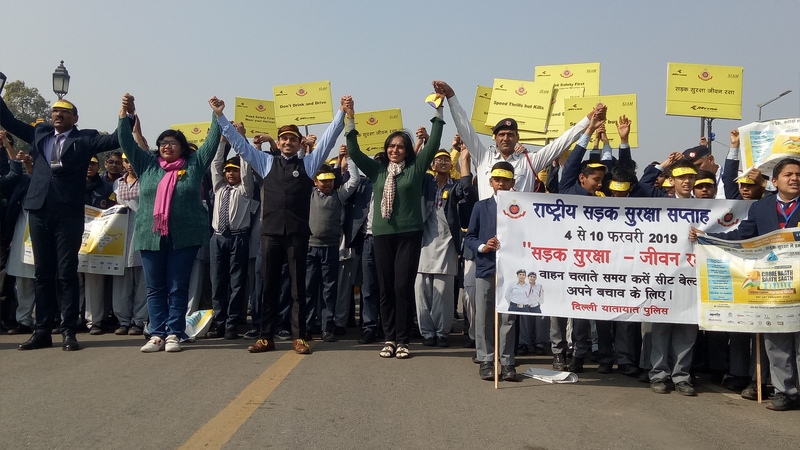 In This Regard, Club D2S – Drive Smart Drive Safe (D2S) launched an exclusive National Human Chain campaign called “#1 Crore Haath Saath Saath” at India Gate. A Grand Human Chain and Countrywide Observance of 2 Min’s Silence in remembrance of 1.4 Million Indian Road Death Victims was Kicked off in Delhi at India Gate by Mr Rama Shankar Pandey MD Hella India lighting Ltd. More than 1500 students from different schools, Volunteers, Defence forces including CRPF, Delhi Traffic Police, Delhi Police and many road users formed the human chain at India Gate. Approx. 5 Lakh Indians have joined hands since the campaign started on 4th February from Derabassi, Punjab. On this occasion, all the people present there resolved to follow the traffic rules and joined hands together for this campaign. On this occasion, The “Drive Safe” Club will reward good driving behaviour through Mobile Based AI application, given free access to only those Road Users who will sign the Code of Conduct. Through the Campaign, Rama Shankar Pandey, MD-Hella India Lighting Ltd. make people aware of the rules and discipline of Road Safety and succeeded the campaign by raising slogan along with the students of schools, colleges and many private & government organizations “Sadak Suraksha Jeewan Raksha” and made National Human Chain of this Action Oriented Campaign, #1 Crore Haath Saath Saath. Through the Campaign, D2S aware the masses and taught necessary options to secure their lives from unexpected danger while driving. Understanding the gravity of the accident situation on Indian Roads & its Urgency to arrest Alarming Road Deaths, NGO Drive Smart Drive safe along with Ministry of Road Transport & highways & SIAM has come up with a unique campaign #1CroreHaathSaathSaathwhere it aims to engage50 Lakhs People by joining 1 Crore Hands starting Road Safety Week 2019 in more than 100 Cities across the Country. The campaign is built on the spirit of Coming Together for transforming Traffic Civic sense on our Roads.